In the interest of full disclosure, I point out here that, of the hundreds of digital pictures I took all over India, the first picture in this post is the one I didn’t (!) but wish I had! So I’m using this one from Wikipedia under the Creative Commons Attribution license. The rest are my own. In a previous post, Taj Mahal and Agra Fort: the rest of the story, there’s a bit of background of Moghul ruler Akbar (3rd ruler after Babar, better known as Shah Jahan’s grandfather) building this city as his new capital in the latter half of the 16th century. The whole complex includes a series of palaces, public buildings and mosques, as well as living areas for the court, the army, servants of the king and the people of the area. 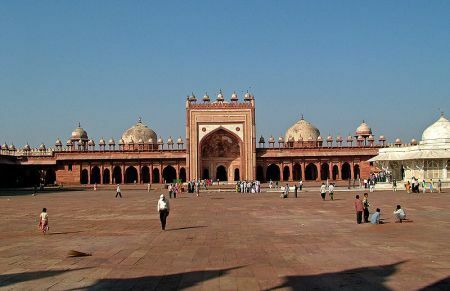 The white marble building on the far right is the mausoleum of Shaikh Salim Chisti, who was much revered by Akbar for reasons which will soon become clear (below). It is believed by Moslems that prayers performed here will be fulfilled, thus many childless women, or those without a male heir, come here to pray. Built originally with red sandstone, later it was converted into marble. 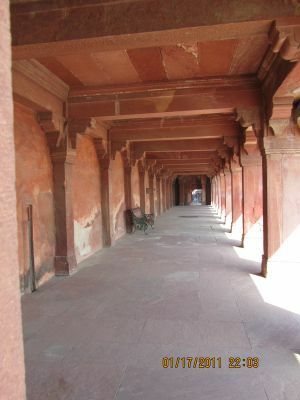 This picture was taken from the entry of the left side of one of the colonnaded hallways that flank both sides of the main entrance to the Fatehpur Sikri Friday Mosque pictured above. I threw it in just because I like it. 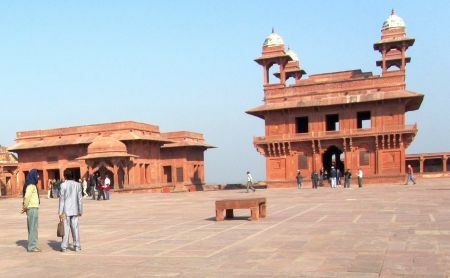 Architectural influences in all the buildings of Fatehpur Sikri represent various religions because Akbar was intent on creating a new religion (called Din-i-ilahi, or the divine faith) that would bring together all the religions of his subjects. (You may remember as well from the previous post that he wed a Hindu princess). The smaller builing on the left is the astrology building. This is where the birth of his son, Jahangi (Shah Jahan’s father), was predicted by the wise Sufi saint, Shaikh Salim Chisti(1480-1572), for whom the marble tomb in the picture above was built. That prediction came true when Jahangi was born in January 1592, which probably had a little to do with Akbar’s admiration for him. The taller building on the right is the Diwan-i-Khas where Akbar held a public audience for his people. He met privately with his cabinet members in another court. Another story that impressed me from my first visit in 1980 was that Emperor Akbar had large boards marked out with inlaid marble on the palace courtyards to play parcheesi outdoors. As pawns he used 16 women from his harem, dressed in appropriately colored clothing, and had them move around the squares according to his directions. 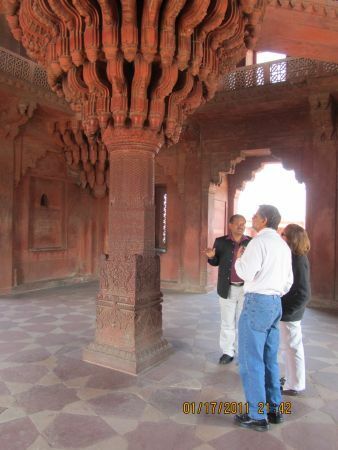 It was from this elevated platform that Akbar listend to his constituent’s problems without exposing himself to potential assassins. Since there were no such things as AK-47s in the 17th century it worked very well. 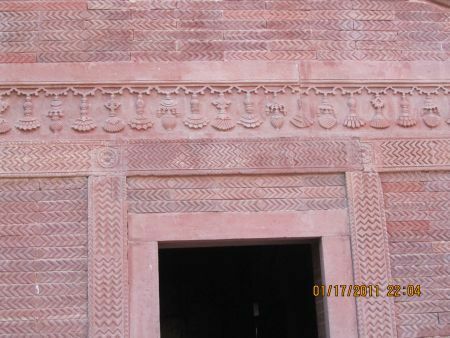 The intricate detailing in the stone beneath the platform demonstrates Hindu influence. 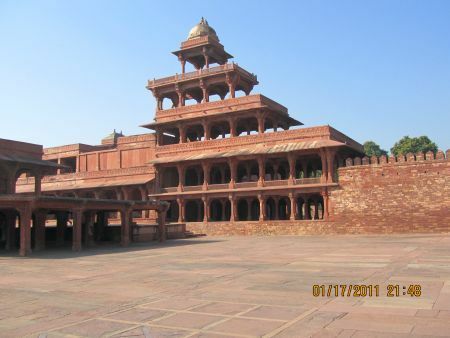 What is most remarkable is that this platform, as well as the rest of Fatehpur Sikri, was constructed without the use of mortar. This is the Panj Mahal (below), its architecture Persian influenced, the tallest building in the city. It serves as a transition building between the semi-public spaces surrounding the court yard and the private spaces of the royal harem. It is five stories tall, open from all sides, and built from local red sandstone. Though its functions are unknown, there are speculations that it served as a pleasure resort for the Emperor, or that it was used exclusively by the ladies and children of the court. Try real hard and maybe you’ll be able to see the ghostly figures of 16 women dressed in yellow, blue, and red, being used as human pawns in a parcheesi game on a courtyard like this one. I think of those women every time I look at this picture. In fact, I wonder about the lives of all the people in other parts of the world, both past and present. In the next posting, I’ll focus a bit on some of them. Absolutely fascinating. Thank you for putting all the pictures on your photohost. I will enjoy the heck out of them when I get home from work today. I’m just curious when seeing the acres of stone, what was the temperature. Would the pawns have been comfortable out there in the courtyard? Good question! Agra does have a winter season and it was just on the tail end of it when we were there on the 18th of January. It began with a bit of chill, then as the sun rose higher toward mid-day we could take off the sweaters and wind breakers and be comfortable. I suspect the emperor himself would not have been out too early in the day, but it would have been very hot later on in the year. I am standing there in one of those squares right now! What a life, I would never cope with it. Great pictures to give the atmosphere.